Bubby and Bean ::: Living Creatively: DIY Tutorial >>> Pretty Holiday Gift Tags with Free Printable Designs! 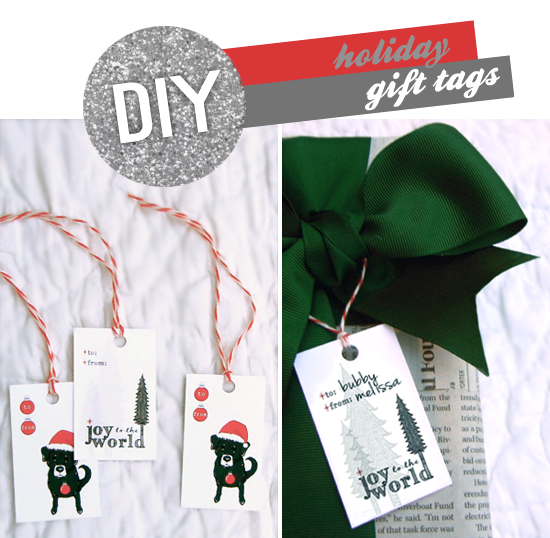 DIY Tutorial >>> Pretty Holiday Gift Tags with Free Printable Designs! I know I'm not the only one who still has a whole lotta gift wrapping to do before Christmas. (I won't even get into the fact that I still have a ridiculous amount of gifts to make and buy.) The good news is that if you're a last-minute wrapper like me, you no longer have to worry your pretty little head about coming up with cute gift tags, because I've got you covered. 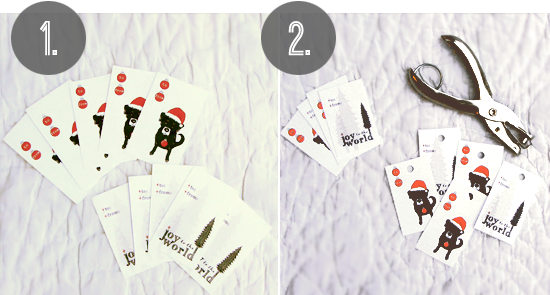 I decided to design my own printable gift tags this year, and I'm sharing them with you! 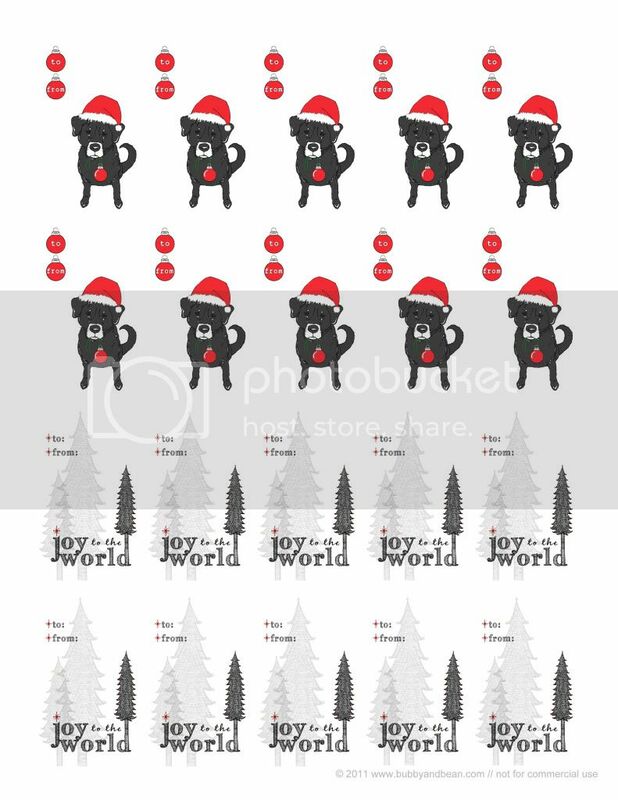 These tags feature smaller versions of my 'Santa Dog' and 'Joy to the World' designs, and the free printable file contains 20 tags per sheet. In less than a few minutes, you can print these babies on regular paper, cut them out and tape them on your packages. 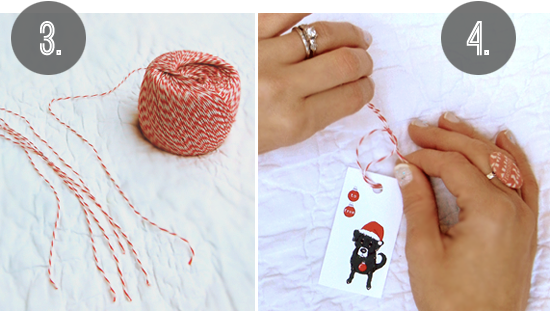 Or - you can follow this super easy tutorial and make your own special tie-on tags that are sure to produce all kinds of "ooooo's" and "ahhhhhs" on Christmas morning. Before you start, gather your supplies, find a place to work, and put on the cheesiest holiday music you can find. 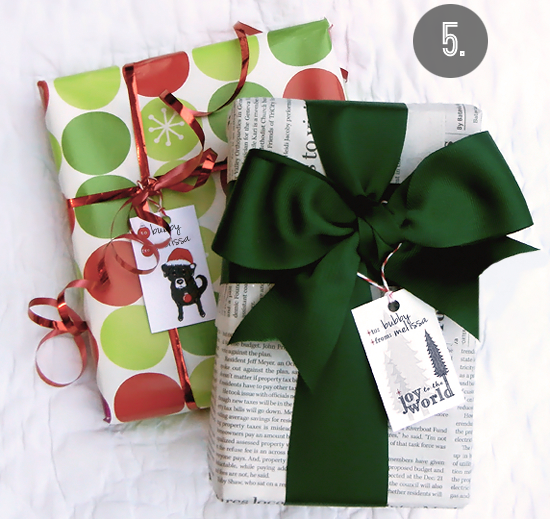 Then print out my holiday gift tag file, which can be downloaded (for free!) right here. I suggest using a heavyweight paper, medium weight cardstock, or medium weight matte photo paper. Make sure to adjust your printer settings to print at high quality. 1. 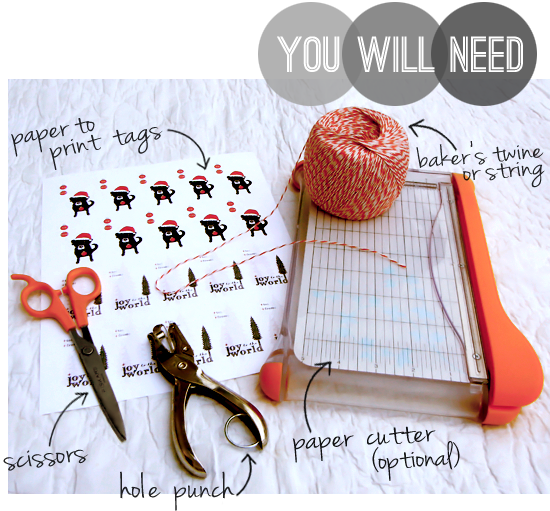 Using a paper cutter or pair of scissors, cut out the individual tags. 2. Punch out holes at the top of each tag with a hole puncher. 3. Cut bakers twine into 10 inch long pieces. 4. Attach twine to tags. The best way to do this is to take a piece of twine, fold it in half, then insert the folded end into the punched hole up through the bottom. Pull the folded end a couple of inches out, then grab the two loose ends, pull up from underneath of the folded end, and tighten. 5. Attach the tags to your gifts and have yourself a holiday cocktail! These are so cute - actually the dog in your logo is so cute! Super fun tutorial - thanks for sharing! How cute! I would love to get a present with such a lovely tag! Oh my gosh these are soooo pretty!! :-) I can't wait to make them!! !